"Preserving the Past...Serving the Future"
present day Fort Pierre to claim the area for France. 1760--The Sioux Indians, having been pushed out of Minnesota by the Chippewa, first reach the Missouri River. On their way to the Missouri, the Sioux drove the Omaha Indians from the Big Sioux and James River valleys. out of central South Dakota. 1803--The United States makes the Louisiana Purchase from France. The area that will become South Dakota is part of the Purchase. 1804-1806--The Lewis & Clark Expedition traveled from St. Louis to the Pacific. 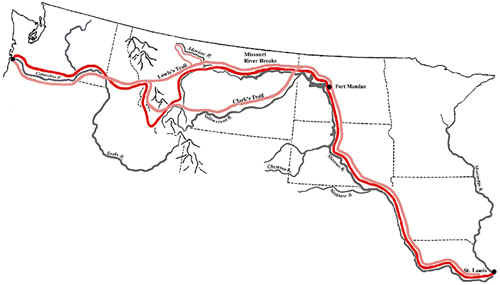 The expedition passes through South Dakota twice. While camped near the mouth of the Bad River in 1804, the expedition raises the United States flag on 25 September 1804. This is the first time the U.S. flag was flown in South Dakota. beginning of the oldest continuous white settlement in South Dakota. and eleven wounded.This fight is one of the first fights between Indians and whites in South Dakota. News of the attack on the Ashley party resulted in the launching of a punitive expedition against the Arikaras. of the 6th U.S. Infantry and several groups of fur traders. A group of Sioux accompanied the troops. was the first military campaign in South Dakota. 1825--Treaties are signed with a number of Indian tribes in South Dakota. 1831--The Yellowstone becomes the first steamboat to travel on the Missouri River in South Dakota. 1838-1839--Nicollet and Fremont conduct several exploration expeditions through South Dakota. site and the establishment of Fort Randall in 1856 causes the Army to abandon Fort Pierre in 1857. Although the Army leaves, people continue to live at the fort site. 1855-57--Lt. G. K. Warren conducts a series of explorations and surveys in Dakota and Nebraska. 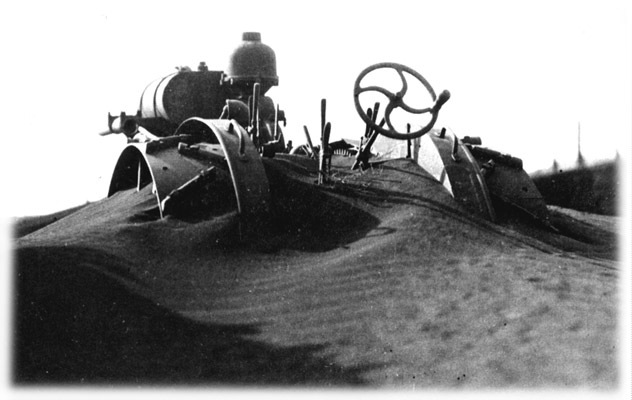 was a reconnaissance of the Missouri River intended to determine feasible sites for military posts. at the site of present day Sioux Falls. government is established, but it is not recognized by Washington. Three major participants in the Yankton Treaty: Smutty Bear who opposed it; Charles Picotte who was the interpreter and profited from it; and Strike-the-Ree, Yankton chief who was resigned to white settlement saying that, "The white men are coming like maggots. It is useless to resist them....Many of our brave warriors would be killed, our women and children left in sorrow, and still we would not stop them". territorial government is made. This attempt also fails to obtain Washington's recognition. 1861--Dakota Territory is formally established. The legislation creating the new territory is signed by President James Buchanan. The new territory includes the present states of South Dakota, North Dakota, Montana, and most of Wyoming. William Jayne of Illinois is appointed as the first territorial governor. against the Indians consisted of two troops of volunteer cavalry and a number of militia units. with the Indians in Dakota. These treaties brought about a temporary end to hostilities. 1868--A treaty is signed with the Sioux ending the Red Cloud War of 1866-1868. Among the provisions of the Ft. Laramie Treaty of 1868 is a clause that continues the Great Sioux Reservation. The area contained in this reservation included the Black Hills. (Dakota Profile - Spotted Tail) Peace Commission at Ft. Laramie, Wyoming, 1868 Shown from right of center pole are Gen. Harney, Gen. Sherman, Gen. Sanborn, General Augar, Gen. Terry, Gen. Henderson and Asa White, commission secretary. 1872--The Dakota Southern Railroad becomes the first railroad to operate in South Dakota, running from Vermillion to Sioux City, Iowa. The road was completed to Yankton in 1873.
the Great Sioux Reservation in the Black Hills area result in the Black Hills Expedition of Lt. Col. George A. Custer. In addition to troops, Custer's expedition included a large corps of scientists and several miners. Gold is discovered in the vicinity of present day Custer and the Black Hills gold rush begins. at the Little Big Horn in June. Stories of gold in the Hills brought the rush of 1876. Thousands of miners converged on Deadwood Gulch and nearby areas. Many people who came to the Hills were not able to find a paying claim and ended up mining the miners by providing supplies, entertainment and other services. Stories about gambling and violence during the Gold Rush may have been exaggerated, but it did bring some colorful characters to the area. Famous gunfighter Wild Bill Hickok was shot to death playing poker in Deadwood's Saloon #10. Calamity Jane, who claimed that she and Wild Bill were lovers, is buried next to him in Mount Moriah Cemetery, also in Deadwood. 1877--A treaty ends the Black Hills war. The United States Government assumes control of the Black Hills. major incentive to settlement. Agriculture and industry both prosper. admitted to the Union as a separate state. Washington refused to recognize the new state. were also chosen for the new state. Once again, Washington refused to grant statehood. 1886-1887--Droughts bring the prosperity of the Great Dakota Boom to an end. hits in January. Over 35 people die as a result of the storm. dropped off greatly. Some settlers left South Dakota to return to their previous homes. depression in the late 1890s. challenges to Pierre's status come in succeeding years. toward the white man and their promises. They were no longer free to roam the plains. protection, leading to the Wounded Knee Massacre. Badlands, they are captured by soldiers and taken to a small village called Wounded Knee. them for weapons. Someone fired a shot, and then soldiers began shooting the Indians. Several hundred Indians, men, women and children, died that day, most of them unarmed. The Wounded Knee Massacre is sometimes cited as the final conquest of the Sioux. Sheldon asked that his words of praise for Taylor be stricken from the official journal. America and the state's treasury was short $367,000. 1896--Andrew E. Lee, a Populist, is elected as the third Governor of South Dakota. Sioux Falls. The 3rd Cavalry spent the entire war in training camps in the United States. Guard troops from Sioux Falls to protect the land office and keep order during the opening. The actual opening proved to be uneventful. legislature initiated the process that led to construction of a permanent capitol building in Pierre. of two direct rail links with eastern South Dakota and eastern markets. 1906--The Chicago, Milwaukee & St. Paul Railroad begins construction of its Pacific Coast Extension. to cross the Missouri at the new town of Mobridge. Construction work on the Missouri River bridge at Mobridge. 1908--The cornerstone of the new capitol building is laid. Reservations to white settlement. The land is formally opened in 1909. 1910--The new Capitol building in Pierre was opened for use. Designed by the same architects who designed the Montana capitol, the new capitol ended the possibility of new fights over the site of the state Capitol. Although growth in the size of state government required an addition to the Capitol building in the 1930s and the construction of several separate office buildings, the building opened in 1910 has continued to serve as the Capitol to the present day. back in Federal service several months later guarding bridges against possible German sabotage. States Senate. He died in office during his third term. 1917-1918--The United States was involved in World War I. South Dakota's major contribution to the war was the 147th Field Artillery Regiment. The 147th was created out of half of the 4th South Dakota Infantry and two batteries of Oregon National Guard Artillery. The 147th saw heavy action as it provided artillery support for ten different American and French divisions. The regiment received numerous decorations and citations from both France and the United States. 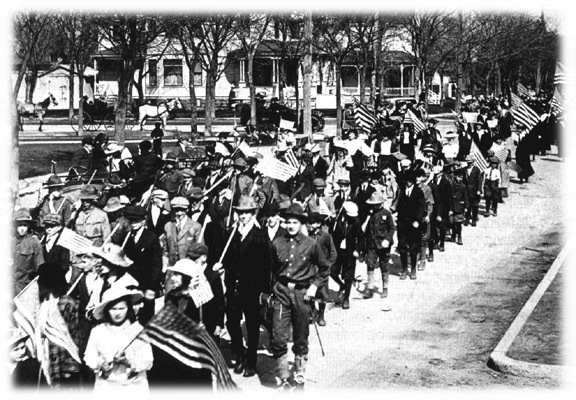 After the war's end, the 147th was retained as part of the South Dakota National Guard. 1927--Gutzon Borglum begins work on the Mount Rushmore monument. The monument contains the faces of George Washington, Thomas Jefferson, Theodore Roosevelt, and Abraham Lincoln. Borglum's work had its origin in the desire of State Historian Doane Robinson to have a monument to American history created in the Black Hills. Although never completed, the Rushmore monument is still a major tourist attraction. 1928--Gov. Bulow pardons Poker Alice, 78, after she is convicted on a bootlegging charge. Gov. Bulow was said to be reluctant to send a white-haired old lady to prison. Poker Alice was a gambler/madam from Stugis whose enterprises catered to the soldiers at Ft. Meade. 1930s--South Dakota is hit hard by the Depression. Drought and dust created severe problems for agriculture. The Civilian Conservation Corps and the WPA provided many jobs. The CCC was instrumental in providing much forest conservation work in the Black Hills. 1939 - President Franklin D. Roosevelt creates Badlands National Park. into Federal service. The regiment is assigned to Fort Ord, California. 147th is ordered to overseas duty in the Philippines. The regiment was in Hawaii at the end of November. stationed in the Darwin area. Gutzon Borglum, 74, dies on March 6 after having worked on Mt. Rushmore since 1927. His son, Lincoln Borglum, finishes the Shrine of Democracy on October 31.
combat service in New Guinea and the Philippines as part of the 158th Regimental Combat Team. units of the South Dakota National Guard to maintain a specific South Dakota identity during the war. extensive duty in the Pacific war as well as spending a short tour of duty in the Atlantic. after the ship was scrapped. 1944--The Pick-Sloan Plan for development of the Missouri River was passed by Congress. This plan resulted in the construction of four dams on the Missouri River in South Dakota. and Big Bend, begun in 1959. All four dams were completed by the late 1960s. is called out to assist in clearing roads. CNW line from Pierre to Rapid City was blocked for several weeks. 1950-1952--The United States participated in the Korean War. training in Colorado and on active duty in Alaska. 1952--A major flood on the Missouri River proves the wisdom of the Pick-Sloan Act. Flood damage is severe in Pierre, with much of the town inundated. The flood causes damage all through South Dakota and in downstream states. The severity of the flood provided additional justification for construction of the Oahe Dam. 1962--The electric generating station at the Oahe Dam is completed. Oahe is the largest of the six Missouri River Pick-Sloan dams, with a generating capacity of 700,000 kilowatts. With completion of the Big Bend Dam and generating station several years later, the Missouri River dams achieved a generating capacity of over 2,000,000 kilowatts of electricity. 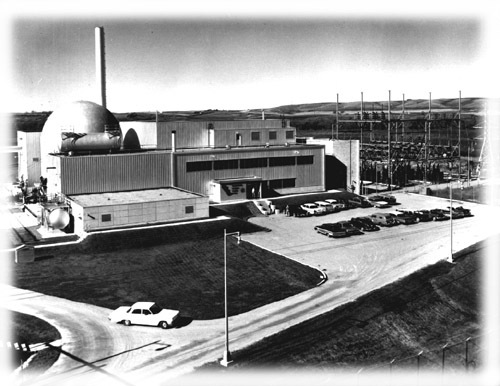 1966 - The Pathfinder Atomic Power Plant built by Northern States Power Company near Sioux Falls begins producing electricity. It was considered the world's first all-nuclear power plant. After only one year's operation, however, it was converted to a conventional power plant because of technical problems. 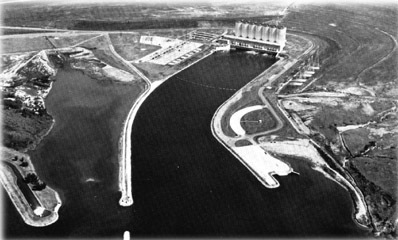 Late 1960s--All four of the Pick-Sloan dams in South Dakota are completed. flood control, navigation, irrigation, public water supplies, and fish and wildlife development. 1973--South Dakota was rocked by Wounded Knee II and the Custer Court House Riots. by the Sioux for the return of the Black Hills to Sioux control. created a medical school for the University of South Dakota. resigned the office in July 1978 to become U.S. Ambassador to Singapore. Kneip was the fifth non-Republican governor and only the fourth Democrat to be governor. after Wollman was defeated in the Democratic primary for governor. William Janklow in January 1979.
to a power plant at Big Stone City, South Dakota, on the Minnesota border. two railroads which were instrumental in the settlement and growth of South Dakota. George S. Mickelson was elected as the 28th governor of South Dakota. Mickelson was the son of George T. Mickelson, who was governor from 1947-1951. Lars Herseth in the contest for governor. Herseth is also the son of a former governor. after voters approved a ballot measure in 1986 calling for establishment of a lottery. A fire in December destroyed a block of the historic downtown area of Deadwood. This fire was the latest in a series of disasters that have plagued Deadwood throughout its history. total crop failures and severe lack of feed for cattle. Deadwood would have to approve gambling in a special vote. established to oversee the games and establish the regulations. game machines to the scratch-and-match games already in operation. Only certain games and low limit wagers were to be allowed on the machines. * William A. Howard died April 10, 1880. ** Richard F. Kneip resigned July 24, 1978, to become Ambassador to Singapore.